They call him the God of the Sun, driving his golden chariot across the sky with four horses at his side. He is Helios, one of the great figures of Greek mythology. 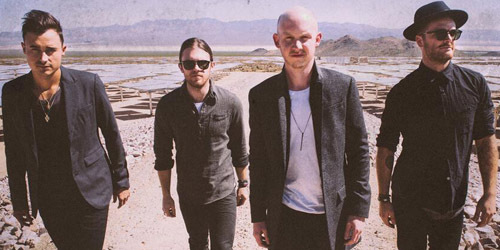 Centuries later, Helios find himself as the name of the latest album by Denver rockers The Fray, the group’s fourth studio release since 2005 for their longtime home of Epic Records. Recorded during the summer of last year, Helios is the quartet’s most diverse album to date and runs the gamut from 90’s alt-rock (“Closer To Me”) to experimental (“Break Your Plans”) and even earthy (“Wherever This Goes”), hitting more musical flavors in-between. It isn’t bound to be a Top 40 Titan per se, but there are some sunny sounds amongst the polished gems and other decently crafted tunes that encompass the eleven tracks. Highlights from the effort include opener “Hold My Hand”, which compares solidly as the “You Found Me” of Helios. Slade sings, “Escape is in my blood/Fear is in my bones/But I don’t wanna walk that road/Please help me.” Combining a Coldplay-esque piano tone, a memorable percussive line and an added gospel choir about halfway through, “Hold” is worthy of being a radio single, retaining the core of their sound while still expanding their horizons. Third track “Give It Away” is also worth a listen, which bops to the more rhythmic, post-disco bounce of Maroon 5‘s latest material. It does work for the band in this instance, even if you can’t picture it at the moment. The pop jam also verges into Paul Simon and Graceland territory with more tribal sounding drums. “Love is free/C’mon and give it away,” says Slade. Hopefully, they wouldn’t be letting this get away from a commercial standpoint either. Track four, “Hurricane”, also follows a similar pattern, updating them into a more electro-pop groove. It’s not as successful to me as “Give” is, but it is an ear worm and you’ll be singing along. As much as they try to fuse styles on their latest album, there are a few tracks on here that maintain the classic The Fray sound, going for a moodier vibe. “Keep On Wanting” taps into their inspirational side against a solid pop/rock sound, one of my favorites of the bunch. There is also “Shadow And A Dancer” and “Same As You”, the two closing songs, which also happen to be the longest. “Shadow” channels an early Peter Gabriel sound, while chronicling the ups and downs of an unexpected relationship: “The summer thrill is gone/But we’ve never been so in love.” “Same” finds itself on an echo-driven, almost spacey kind of ground, far different from anything else on here. Through the ending, the variety is there — but is there enough of an audience still interested in them? With a single that’s stalled out at radio and a diminishing sales trend, this album obviously isn’t going to reach as many ears as their past three efforts have. There’s not a bad track on here, even if some are a tad more unremarkable than the obvious standouts. It does seem, however, that they sacrificed a few choruses, especially lyrically, and I do wish the emotive side of the band was more present on here. “Love Don’t Die” also feels like a lazy hit within the context of this album, and as much I like it, there are stronger options for singles releases and it can be easily dumped. That being said, there’s enough material to satisfy both old and new fans of the group and enough of an evolution without falling into a sonic trap as many other similar acts unfortunately have lately. They may not be the gods of mainstream radio anymore, but Helios proves that The Fray can still offer up some worthy artistic ambrosia to the masses. Stream Helios on iTunes and pre-order the album, due on Tuesday (2/25).